Abduction bar for managing the prescribed width and orientation of the corrected clubfoot. 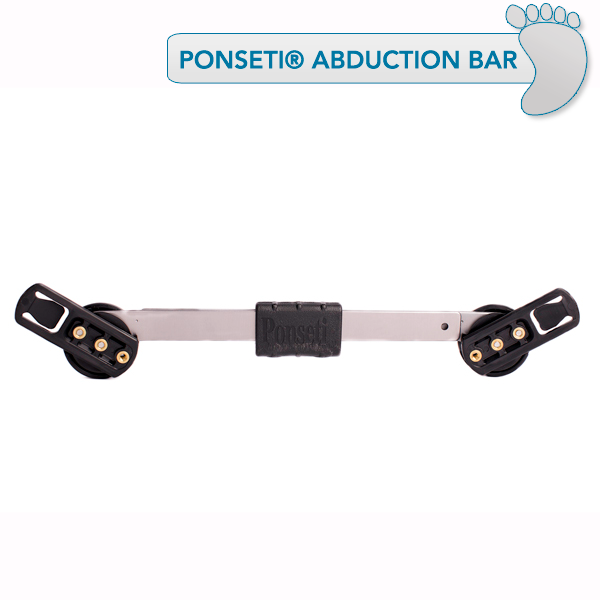 This adjustable bar easily clips on and off the AFO footwear by means of our patented "Quick Clip" system. This system provides greater ease of use by increasing ease of clothing changes, placing the child in a high chair or shopping cart and allows the AFO to be applied without the bar obstructing access to the foot. Available in sizes Extra Short, Short, and Long. Size Extra Short is recommended for a shoulder width of 7-10 inches, Size Short for 8-12 inches, and Size Long for 9.25-15 inches. All bars are pre-packaged at 60° abduction and 10° dorsiflexion. Abduction can be easily changed with a Phillips screw driver; instructions are included with your bar. If modifications are required for dorsiflexion or if you need the extra short bar cut down to accommodate less than 7 inches, please call the office immediately after your order is placed. Please reference your Order Number when you call so we can schedule the modification.